Wow! a lot cheaper than when I bought mine. I really love my immersion blender. I've had a couple and think that Bamix is the best brand. I do love my immersion blender. It makes the best Restaurant Salsa. Never thought to use it for re-fried beans. I'll make some today. Those look like very trendy immersion blenders which i'd love to get for my kitchen to make frappes. A must have for me. I don't have a food processor but I couldn't get by without my immersion blender. This is one gadget I think I might have to get! You know, I balked a bit when my Mom bought me one for Christmas. I reacted the similarly when I was given a hand mixer for my wedding. But, I was wrong. I admit it. I use my stick blender a lot. 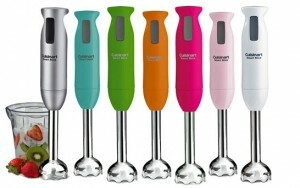 I have the Cuisinart Smart stick blender. I threw the whisk attachment away after first use. (Not pictured on Amazon.) But, I use the food processor for mixing dips, chopping cilantro, etc. I use the stick blender for mixing lots of thing. It is quick to get out and clean up. It beats getting the blender out for everything.